The Irish prime minister, Leo Varadkar, has issued a personal appeal for people to remain indoors as Storm Ophelia started to batter the country with winds of up to 100 miles (161km) per hour, and a woman died in the south-east of the country. With all schools and colleges closed and the transport system virtually halted, the Taoiseach said it was the worst storm to hit Ireland in 50 years. As Varadkar described the impact of Ophelia as a "national emergency" on Monday, a woman in her 70s was killed when a tree fell on her car near the village of Aglish in Waterford. Referring to Storm Debbie in 1961, Varadkar said: "The last time we had a storm this severe, 11 lives were lost, so safety is our number one priority." Speaking before an emergency meeting of the government in Dublin, he called on people to stay at home, stressing that the red weather warning applied to all cities and counties across Ireland. Varadkar said the danger to the public would not end once the storm had passed because there would be fallen trees and felled power lines across the country. "Staff are ready to come in from Northern Ireland and Britain to assist in the coming days in restoring power. We can only restore the power lines when it is safe to do so," he said. The Irish foreign minister, Simon Coveney, speaking from his native Cork, one of the worst-affected parts of the country, said: "This is a weather event the likes of which we have never seen before." 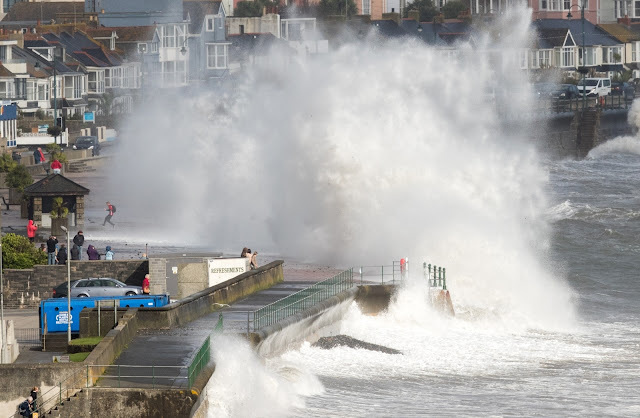 Coveney said the government had been briefed that the strong winds would whip up waves up to 40ft (12 metres) high and "taller than a double-decker bus". Met Eireann, the Irish weather service, said Ireland would bear the brunt of Ophelia for three to four hours on Monday. As the storm struck at about 10am, there were outages due to felled power lines in the south and south-west of the country. By lunchtime, about 100,000 customers were without power, according to the electricity supply board. More than 140 flights from Irish airports were cancelled and by 10am, all Dublin Bus routes in the capital were shut down. The city's Luas tram system was also closed over safety fears. Every creche, school, college and university in Ireland was closed. All trains out of Dublin's Heuston station, which runs rail connections to the south and west of Ireland, have been cancelled. "It's getting quite rough, the place around Spanish Arch was very windy and some of the businesses have floodgates up. Yet there are loads of tourists still milling about, which is bizarre," she said. In Northern Ireland, Bill Clinton's visit to Belfast was cancelled because of the storm. The former US president was due to meet political parties represented in the Stormont parliament to urge them to find a way to restore the power-sharing government.